For information on the classed I teach see detailed information below. I currently teach at The Barn on Bainbridge Island, Seattle Findings in Lynwood, NW Rockhounds in Seattle and at The Schack in Everette. For the most up to date schedule please view their events pages directly or click the Events link above. I also teach private classes at my studio in Ballard, or do parties and events at your location, please email me for details. If there is a technique or class you are interested in that is not listed below, please contact me directly as I am sure I can help you out. Teaching is one of my favorite things to do as I love to share knowledge and connect with people. I hope one my classes fits your schedule as I can't wait to meet you and teach you. 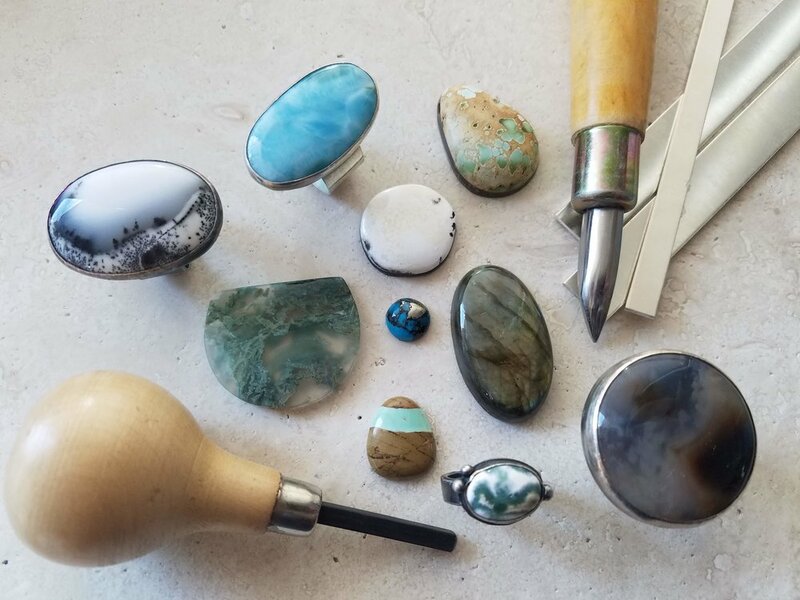 In this project based class you will learn how to cut sheet metal using a disc cutter, form the disc into a cup and attach the cup to metal to create a cold connection and beautiful finished earrings (or a pendant). The techniques learnt in this class can be used for a variety of jewelry making. In this technique based class you will learn a variety of basic techniques in the first part of the class including dapping, riveting, sawing, sanding, drilling and filing. In the second part of the class you will take those techniques and create a variety of geometric jewelry. Enter a new realm of jewelry making by learning how to use a jewelers saw. This often frustrating tool will be brought down to size in this easy to follow and fun to participate in beginners class. Learn how to put your saw together, thread your blade, pierce metal, and sand and file the final piece. This fundamental tool is made accessible through simple instruction and trouble shooting. Learn you how to create a prong setting out of sterling silver to hold any shape cabochon stone. You will learn basic soldering skills, sizing and shaping your wire to create a dynamic setting for a cabochon stone. You can make a necklace or earrings in this class. In this class you will learn to stamp metal with words, sayings, song lyrics or numbers. In this fun and accessibly class you will learn the basics of metal stamping, discover some tips and tricks to make the process easier as well as fun. Learn the basics of soldering and bezel setting in this two-day intensive introductory class. You will learn jewelry making basics such as sawing, filing, sanding and texturing on metals like copper and sterling silver. You will learn the basics of soldering and general stone setting, and will complete at least two rings. This is an introductory class with no previous soldering experience needed. Learn you how to make cute little tassels to incorporate into necklaces, earrings and bracelets. In this class you will make your own tassels using silk and cotton thread, glue and scissors. You can then use these cuties to embellish your jewelry. Create dynamic Tentacle earrings in a couple easy steps. Using a butane torch you will learn to create balled head pins, you will then learn to shape them and wrap them into an interesting earring shape. Them using Vintaj patina you can color the metal or use Liver of Sulfur to oxidize the metal to create an aged appearance.